Chris Brown has been low key dating a new chick that has a striking resemblance to his ex-girlfriend Karrueche Tran. The “Ayo” hitmaker has even introduces his daughter Royalty to his new girl, who is an Instagram model. Sources close to Breezy are saying that their relationship is getting serious very fast. 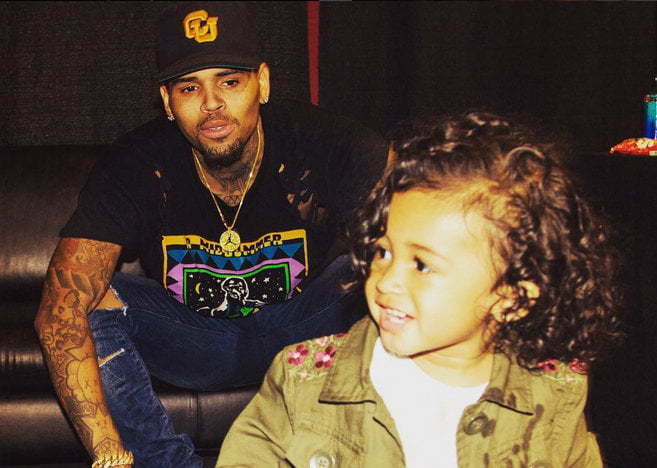 Chris Brown and his daughter Royalty were spending some time with his parents in Virginia last weekend and sources told us that he brought his new girlfriend a long with him. The R&B singer shared a few family photos on his Instagram page showing his dad, mom and daughter. “#family VA!!!!!!! A father who taught me to stay focused. A mother who believed in her son. And a daughter that teaches me about life everyday. (DAD???? WHAT ARE THOSE??? )” he wrote on Instagram. Chris Brown has been enjoying fatherhood despite some baby mama drama with Nia Guzman who is taking him to court for a hike in her child support. The former video model also want a judge to give Breezy only supervised visit claiming that he is a bad father. Breezy does look like he adores his daughter Royalty. Awww royalty a problem!!! Beautiful!!! Looking over few online photos of Royalty and Chris “that’s your child; she’s growing up fast while resembling you more & more!!!!!!!! That’s “a beautiful feeling when everyone you love and who loves you R smiling, enjoying life PEACEFULLY!!!!!!!! Royalty is having the most fun though climbing all over daddy; boy she has a head full of hair!!!!!!! Genetically provided by both mom and dad w good looks 2 match. I just hope & pray that Chris CAN remain playfully happy, silly, childish yet SERIOUS when the time is right; that’s the boy we all met in ’05…….